Snow Bengal cats also come in spotted and marbled patterns. Want to learn more about this unique feline? Here are a few interesting facts about these "snow" kitties. Experts believe that the first Snow Bengal was the Seal Lynx Point (see picture above). During the early days of the Bengal breeding program, some kittens would be born with different coloring and spotting variations. These kittens were also born with blue eyes. Interestingly, this particular Snow Bengal carries the colorpoint gene, which is associated with the Siamese cat. So it is believed that Snow Bengals share ancestry with the Siamese. By the way, the gene that causes the colorpoint pattern is a recessive gene. You will read more on genetics below. All Snow Bengals also carry the naturally occurring albino gene, which produces light hair and light-colored eyes. A completely albino cat will have white hair and pink eyes. Two new versions of the Snow Bengal cat were developed during the late 1980s. Two Bengal breeders, Gene Johnson from the Gogees cattery and Bob Dundon from the Nola cattery, wanted to create a livelier Snow Bengal cat. They achieved this by introducing the Burmese into their breeding program. The result was two genetically different Snow Bengals: the Seal Mink and the Seal Sepia. These two Snow Bengals are also genetically different from the Seal Lynx Point. Because of these differences, each Snow Bengal represents a different division within the breed. The Seal Lynx Point has an ivory ground color with contrasting spots. These Snow Bengals have blue eyes. The Seal Mink is born with a beige base color which later changes to brown. Seal Mink Snow Bengals have green eyes. The Seal Sepia is born with a medium to dark brown ground color which later grows to a darker shade, especially the markings. The eye color of Seal Sepias can be gold or green. The Seal Lynx Point Snow Bengal receives from their parents two copies of the lynxpoint/colorpoint gene. 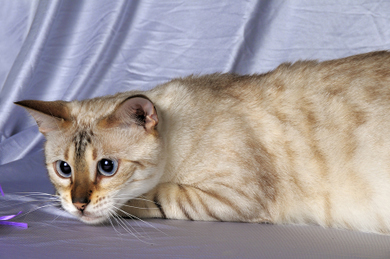 The Seal Mink Snow Bengal inherits two copies of the lynx point/colorpoint gene and the Burmese/sepia gene. The Seal sepia has two copies of the Burmese/sepia gene. In addition, all the genes responsible for producing Snow Bengals are recessive genes. This means that any of the traditional Bengal cats can carry these genes. These recessive genes can remain dormant for many generations. And since the Snow-Bengal-producing genes are recessive, it is important to remember that in order to produce a Snow Bengal kitten, both parents must carry the the Burmese/sepia or lynxpoint/colorpoint gene. 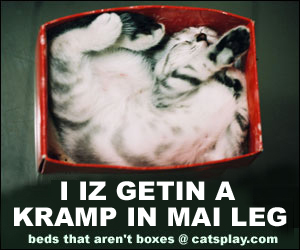 Want to read more about Bengal cats?